The key to successfully adopting team collaboration apps is having a proactive strategy. Team collaboration applications are all the rage these days, with UC vendors, along with a slew of emerging players, battling for market and mindshare as they seek to disrupt the traditional collaboration environment still largely based on email and telephony. Nemertes Research's most recent data shows that already about 28% of companies have adopted these apps, or will do so by the end of 2017, while another 30% are planning to adopt in 2018, or evaluating potential future adoption. As team collaboration applications disrupt the traditional internal and external collaboration paradigm, IT leaders tell us they are often struggling with how best to evaluate, adopt, and integrate team collaboration into their environments. Here are five tips to ensure success. The team collaboration market is wide and diverse. The below chart provides a snapshot of players in this space. Starting on the left, we see the traditional UC vendors who have all either delivered a stand-alone team collaboration app, or who have replaced their former UC clients with team collaboration-based apps. Moving to the right in the chart, we see emerging vendors who have entered the team collaboration space with stand-alone offerings, many of which include UC features like click-to-chat (voice and/or video) as well as screen sharing. 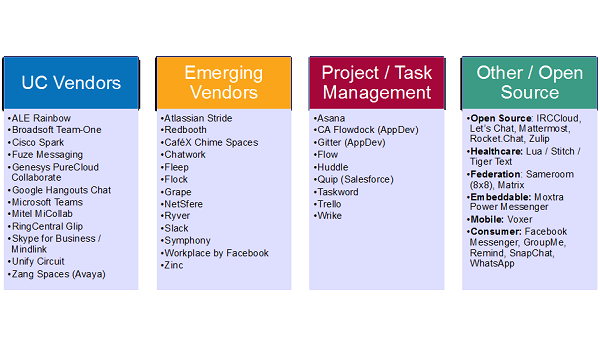 Further along to the right are vendors who offer other team collaboration apps like project management and group workspaces, some of which have their own chat functionality, or provide integration into other team collaboration apps. Many IT leaders I speak to tell me that their biggest challenge is deciding whether to have a single enterprise-wide standard for team collaboration or to enable individual business units to use whatever tool best suits their needs. For regulated organizations, the single-solution approach may be the only option due to enterprise requirements to centralize records. But for other organizations, a multi-vendor approach may make more sense. It's not unusual for us to find organizations in which sales teams are using, say, Salesforce Chatter or Quip for their internal communications, while application developers are using Atlassian's products or Slack for managing Agile development. Ultimately, let the needs of your business, your governance policies (with input from your risk protection function), and business case factors -- cost, existing vendor strategies, and ease of use, etc. -- guide your decision-making. If you are simply considering adding team collaboration apps to your existing mix of collaboration tools, you aren't likely positioning yourself to obtain the benefits these apps can bring to user productivity. Most apps feature a broad array of integrations with existing business applications, while the team collaboration apps from UC vendors offer native ability to integrate with existing voice and video systems. In addition, some team collaboration applications provide APIs to allow you to embed features directly into existing business apps. So, on the one hand you could have an HR group processing expense reports within Slack, while down the hall, a sales team is chatting with peers directly from within the CRM. Nemertes' research continually shows that organizations that have formal programs to promote awareness of collaboration applications, and that provide scheduled training, achieve greater uptake and use versus those who simply push the apps out with little fanfare and rely on viral efforts to promote awareness and use. In almost all cases, user adoption success starts with getting executive buy-in for the app. If your boss doesn't want to use the team collaboration app and prefers instead to stick with email, it's not likely that others will embrace the team app! Specific to team collaboration, your user training program should provide guidance on how to manage interruptions that near non-stop conversations across dozens or hundreds of rooms/channels can bring to the workplace. Fortunately, all team collaboration applications offer the ability for users to create rules that govern what alerts they see. For instance, in my own use of our internal team collaboration app, I've set rules so that I'm only notified in channels I've marked as "favorites" or when I'm specifically tagged in non-favorite channels. I also use the ability to snooze notifications whenever I need to focus on a work task. Conversations within team collaboration applications should come under the same governance policies as other internal and external communications (e.g. email, instant messaging, etc.). That means having a proactive strategy for archiving messages, and retrieving them if necessary. Governance also typically extends into security and user identity management, typically meaning the need to integrate team apps into single sign-on systems to enable centralized account provisioning and rights revocation when a person leaves the company. A proactive user management strategy is especially critical when team spaces involve people from outside the company. In addition, evaluate vendors based on their ability to support your security needs, including their ability to support possible requirements like end-to-end encryption and allowing you to hold your own encryption keys. Following these five tips won't guarantee success, but it will reduce the likelihood of failure. Consider all of these steps as part of your proactive team collaboration evaluation and implementation strategy.